Relay applies 120VAC power to load when dark. * BIAS CONTROL: Increasing resistance biases circuit towards "ON" state. This control is optional. If the bias control is not used, replace with a short. ** SAFETY POLARITY CHECK: Ground terminal for polarity check. If neon lamp lights, polarity is correct. 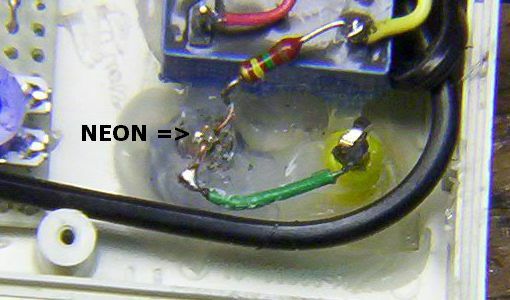 If neon does not light, reverse input plug. Read the safety considerations below. *** See load addendum below. The transformer secondary, the two diodes and 270 uF capacitor develop the 6-9 volt DC operating power for the circuit. The 8.2k resistor, 1k adjustable resistor and the LDR form a voltage divider. The resistance of the LDR varies inversely with the intensity of the light falling on it. In broad daylight the resistance of the LDR is about 100 ohms and the voltage on pins 2 and 6 is near the negative power rail. As darkness approaches, the resistance of the LDR increases and the voltage on pins 2 and 6 of the 7555 rises. 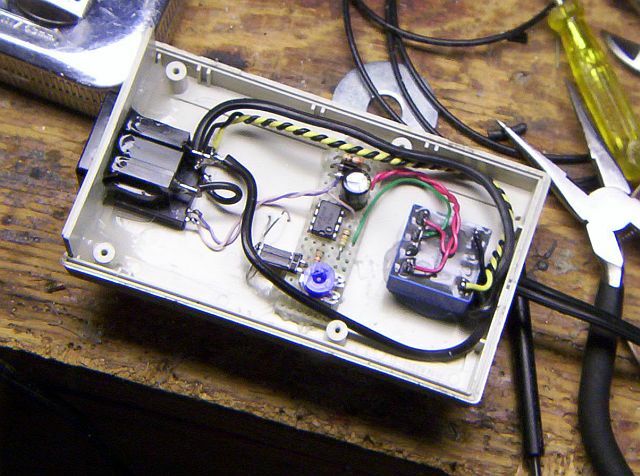 The 7555 acts as a voltage comparator. When the voltage on pins 2 and 6 reaches approximately 2/3 the positive power supply rail voltage, pin 3 goes low, entergizing the SS relay. The relay completes the AC circuit, supplying voltage to the load. As daylight approaches the operation is reversed. The resistance of the LDR goes down and the voltage on pins 2 and 6 goes down. When the voltage on pins 2 and 6 reaches about 1/3 the power supply voltage, pin 3 goes high, de-energizing the SS relay. 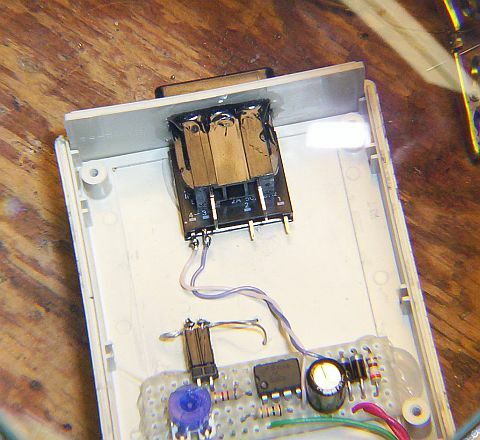 The 10k resistor provides negative feedback which acts to narrow the 2/3 - 1/3 on-off window.† The 150k resistor limits the current in the neon lamp to about 200 microamps. †Decrease the value of this resistor to narrow the on/off window; increase the value (or remove) to widen the window. All parts are secured to the case with silicone rubber sealant (RTV). 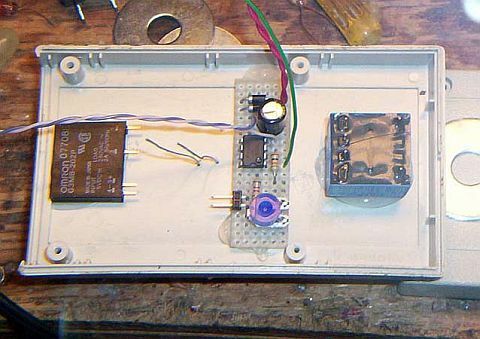 Most of the small components for the project are mounted on the board. 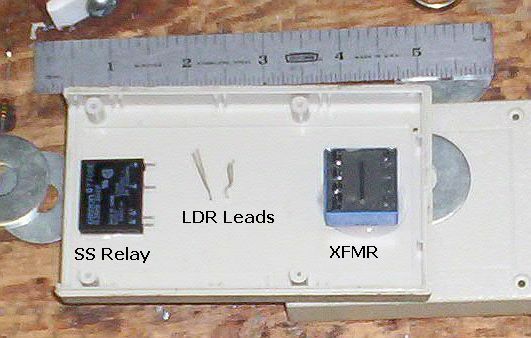 The 2-pin header will connect to the LDR. Tip jack (this will be the grounding terminal), 150k resistor, LED mounting sleave, NE-2. in an ocean of RTV. Yes, that's a bottle cap. It protects the LDR and gives it directionality. This is an outside location protected from the weather under an eve. Disconnect the Photo Relay from the power source before working on any appliance or wiring controlled by the device. 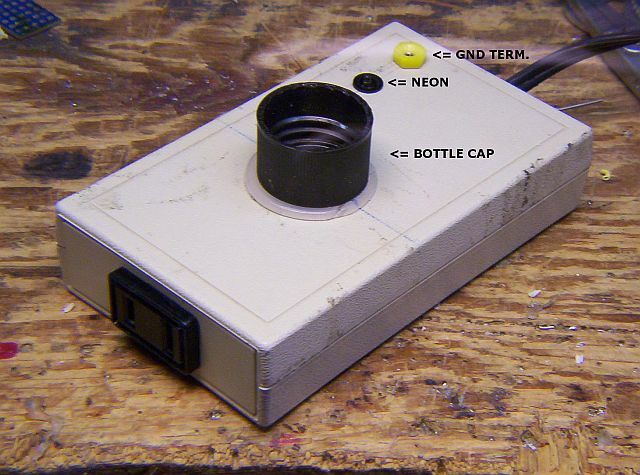 The photo relay can be constructed as a 240VAC single-pole version by substituting a 240-volt transformer for the transformer shown in the Figure 1 parts list above and deleting the 150k resistor and neon lamp. No other changes are required. 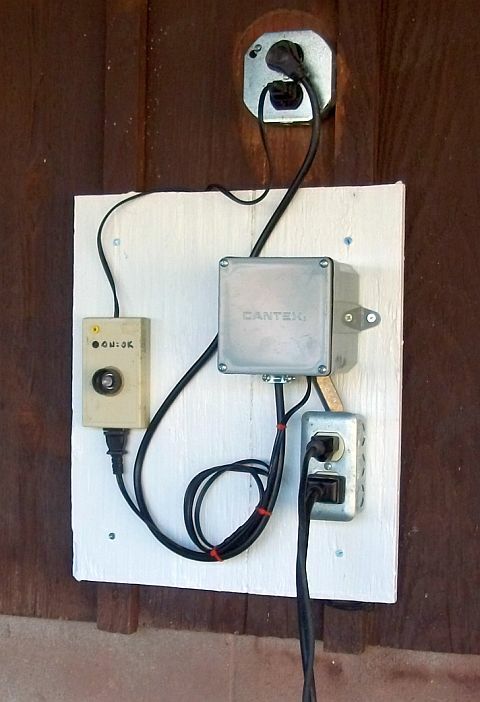 The single-pole version is appropriate for portable (temporary) service only if the relay will be connected to a 240-volt fully floating and balanced branch circuit protected by a ground-fault circuit interrupter (GFCI). A two-pole version is shown in Figure 2. 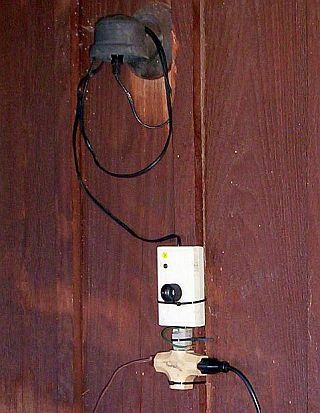 Use this configuration if the photo relay will be connected to a non-GFCI protected 240-volt branch circuit (or if the circuit breaker type is unknown). The light sensor (LDR) can be remoted with low-voltage wiring to make a "weather-proof" version of the circuit as shown in Figure 3. Encapsulate the LDR in a transparent or translucent water-tight outside enclosure; install the remainder of the circuit at a weather-protected inside location. For higher current applications, the solid-state G3MC series relay/s and 390-ohm resistor/s specified can be replaced with a high-current solid-state relay (or relays) such as the Omron G3NA-2xxB-DC5-24 series (up to 90 amps) or Crydom H12WD series (up to 125 amps). Replace the 390-ohm resistor/s with a short. Alternately, the Figure 1 circuit can be used to drive (pilot) a 120/240VAC electromechanical relay or contactor, as shown in Figure 4. 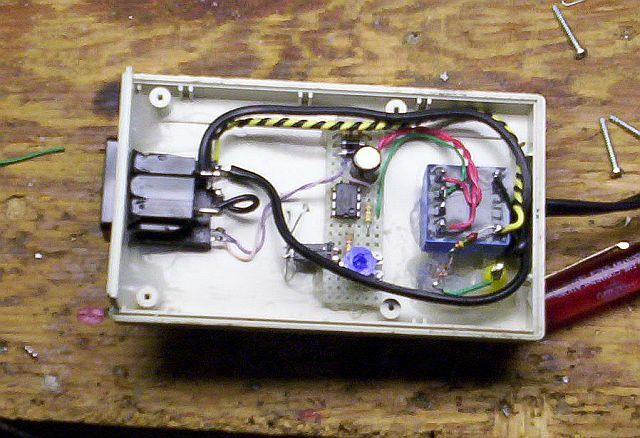 Photo relay drives elecromechanical relay. 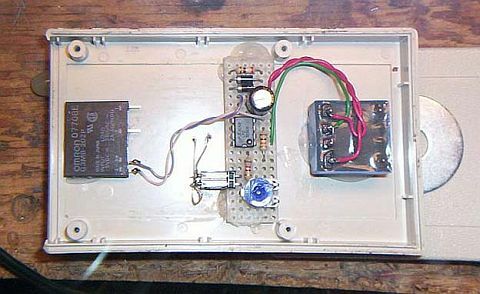 The electromechanical relay is in the gray box. The relay circuit can be modified to de-energize the load when it gets dark. The circuit remains the same in all respects except that the wiring of the SS relay and its associated 390-ohm resistor are changed as shown in Figure 5. Note that operation of the BIAS control changes. * BIAS CONTROL: Increasing resistance biases circuit towards "OFF" state. This control is optional. If the bias control will not be used, replace with a short. An interesting effect can be seen when the relay is connected to a string of LED decorative lights. 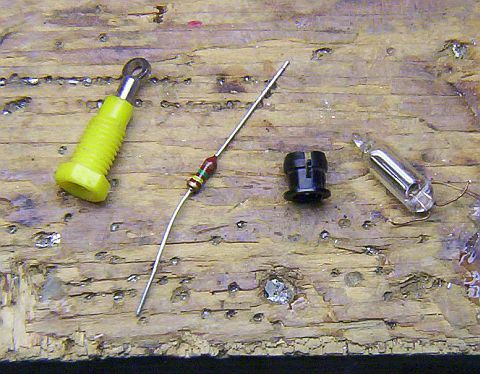 These srings consist of a rectifier and 35 or so LEDs connected in series (70 LEDs for 240-volt strings). Since LEDs are high-speed non-linear devices, they switch off each time the drive voltage drops below a threshold of 2-3 volts per LED. This occurs in normal operation twice during each AC cycle. The LEDs appear to be glowing continuously but in fact are flashing at twice the frequency of the AC power line. The minimum load/maximum resistance requirement comes into play when the SS relay switches to the "OFF" state. Each time the string voltage drops below the LEDs' threshold voltage, the string looks like an open circuit to the relay. The relay tries to supply current to the LED string and the string voltage rises to the threshold. The result is a series of clipped-at-the-threshold pulses being fed to the LEDs at 2x the line frequency. The visible result is, instead of going dark, the string glows dimly. This occurs regardless of the number of LED strings connected to the relay. If your only concern is to eliminate the dim glow of the LEDs when the Photo Relay is off, a relatively high-value resistor can be used. While this will not allow the SS relay to completely switch to the "OFF" state, it will lower the output voltage enough to extinguish the LED string. 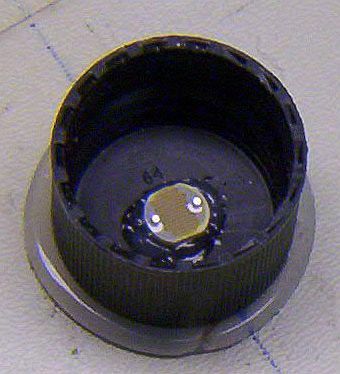 Probably the most practical place for this resistor is across the terminals of the Photo Relay's output load receptical, as shown in Figure 6. 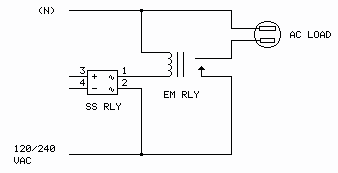 The presence of this resistor will not affect operation of the relay with other load types. 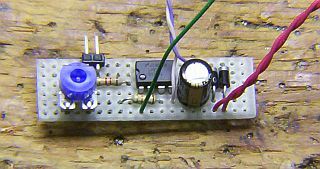 Optional load resistor when Relay is to be used with LED strings. The specified SS relay has a surge current rating of 30 amps. While this is perfectly adequate for most load situations, including fluorescent lamps and motors, there is one type of load where it may not be: non-power factor corrected (PFC) switching power supplies. These supplies typically operate directly from the AC line with a full-wave rectifier followed by a large-value ripple filtering capacitor. This capacitor represents a virtual short-circuit to the line at the moment power is applied and 100 amps or more may flow during the first cycle or two after turn-on, greatly exceeding the SS relay's surge rating. A well-designed switching supply will include power factor correction or an inrush current limiter, also known as a Negative Temperature Coefficient (NTC) thermistor, which prevents this happening. If you are unsure of your switching power supply you may want to include one in the Photo Relay as a precaution. 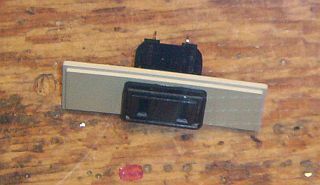 The current limiter is connected, as in the above example, at the rear of the load receptical. The inrush current limiter should be connected between the SS relay and the load as shown in Figure 7. The current limiter specified will limit the inrush current to well below the SS relay's surge current rating. The current limiter will run warm during normal loaded operation. Optional inrush current limiter, needed only when the AC load is a non-PFC switching power supply.